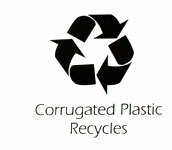 Corrugated plastic is stronger than corrugated paper, without the high breakdown rate, tearing, dust or pollution. Corrugated plastic containers last though use after use, drastically reducing your yearly expenditures and lowering your cost per cycle. Cost savings also occur due to reduction in waste, replacement inventory, and storage costs. Corrugated plastic provides both the strength of plastic and the cushioning characteristics of corrugated material. Yet it is quicker and easier to produce than custom injection-molded products, with little investment cost and less lead time. All boxes are L-lock top and 1-2-3 lock bottom boxes.